They'll fight over it when you're dead. 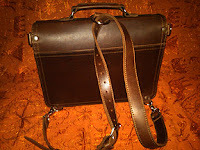 ome time ago, I (ahem) "borrowed" a Herman Miller tote from my company during the dotcom bust. That was some nine years ago, and since then the canvas has frayed and the bag has begun to look ratty. It has other uses still, but it's not going to do for client meetings. Time for a new bag. I wanted something elegant and timeless, and I also wanted something rugged and strong. I was looking for the Louis Vuitton steamer trunk - but in a tote. My first thought was to turn to my trusted source of Swaine Adeney Brigg - maker of fine umbrellas and leather products. 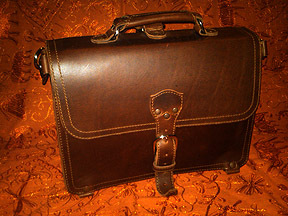 Their briefcases are gorgeous - hand stitched leather of the highest quality. But there was a problem - price. A small attaché started at $2,625 - and that just seemed a little high. So I kept searching. What I found was a lot of so-called "luxury leathergoods" companies out there that concentrated more on style than on manufacturing. If you're the type of consumer who is looking for a beautiful bag that will last you three to five years, options abound. Unfortunately, that's not what I had in mind. When it arrived, I was not disappointed - it was everything it claimed to be. You can feel the tank-like construction in your hand - and it's no wonder that it carries a "100-year warranty." I thought the whole concept of using the strap as a shoulder strap or a backpack sounded a little gimmicky - but I've quickly discovered that I like the backpack configuration a lot - so I use it everyday. The pigskin lining that is used - the same used on a football - has some amazing durability - it's not going to get punctured with a pen or with loose keys. The leather is thick and heavy and pristine, and it's the kind that will look better with age. I just wish I could fast-forward its existence a bit so I can have that patina now! Yessiree - I'm sold. If you read the comments coming from other customers, you'll see that quite a few people have become addicted to Saddleback's products. I'll be buying more as well; there's at least two other bags I want pretty badly. If you're looking for top-quality leather products, start here! adeira has an interesting history. The island of Madeira, off the coast of Morocco, was settled by the Portuguese in the 15th century, and the settlers were quick to discover it's wine-making potential. Popularity of "standard wine" (what we think of when we buy wine today) grew and grew until Madeira wines became a prized possession. The wines were shipped everywhere and quickly made their way into the triangle trade between Europe, the West Indies, and the (then) British Colonies. This meant that the wine took quite a trip through the blistering heat of the lower latitudes, giving it a "baked" quality that was quite unique. Around the later half of the 18th century, it was all the rage in the Americas and was deemed the American wine of choice. Fortification was added, and sea captains passing through the equator would carry large casks of it as ballast in order to add more quality and character to the wine. Just as the process was really being perfected, two mammoth setbacks occurred with Madeira wine. The first disease to hit the vines took place in 1851, when Oidium struck. The crops were devastated and had to be replanted. That was all well and good until Phylloxera hit in 1872. 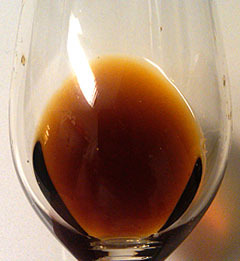 The second crisis prompted the consumer public to move on to something else, and the popularity of Madeira died. When I first tried Madeira, I bought the very inexpensive "Rainwater Madeira" at around $25/bottle. It was good and I appreciated the qualities of Madeira, though it was not terribly complex. Intrigued by its properties, I soon discovered older, and then VERY old Madeiras offered for sale, and I thought perhaps it was time to step it up and see what this wine can do. As a basis, there are four main types of Madeira that are based upon different grapes that yield different levels of sweetness. From sweet to dry, they are Malmsey, Bual, Verdelho, and Sercial. The 1933 I acquired (see post below) was a Malmsey. A brownish amber in color, you can tell this has been in the cask for a while. The nose is of raisin and prune and oak, with a distinct nuttiness reminiscent of a 40 year old tawny port. On the palette, the complexity is outstanding with raisin and allspice and vanilla and candied orange and on and on. Every sniff yields something new. While it's sweet, like a tawny port, it has a mouthwatering acidity to cut right through. I'm impressed, and now curious to go further back in time - Madeiras can still be bought as old as vintages from the late 18th century. Outside of the properties of the wine, I can only imagine the historical thrill of drinking a wine that was grown while George Washington was still president. I hope I have that opportunity - but in the meantime this is a nice way to pass the winter.